I have developed a NestJS Server application. NestJs is a node server running with express written in TypeScript. I already set the hostname to 0.0.0.0. What else can I do? # reload !!! IMPORTANT !!! I'm using NestJs to create a couple of applications and I want to move the code from a NestInterceptor for an external NPM Package so I can use the same interceptor in multiple applications. The problem is that the same code that works when used "locally" just stop working when moved to the external package. ConnectionNotFoundError: Connection "default" was not found. Any ideas, on what causes this and how to solve it? I have a function that gets an order from a database, creates an object from the response, gets a response from the db for all the line items and loops over those item to get detail records. The problem I am having is that the overall function is returning even though I am trying to await the response from the subqueries. So the code will get into the forEach on the order Lines, create the add Item, but then it will push the addItem before waiting for the result of the orderLineDetails to be created and added to the orderLineDetails array. If I let the whole thing run, the breakpoint with the push for the orderLineDetails will run a second after the response has already returned. I have a NestJs backend where I want to generate a JSON schema out of my @nestjs/swagger annotations for validation purposes (with AJV). 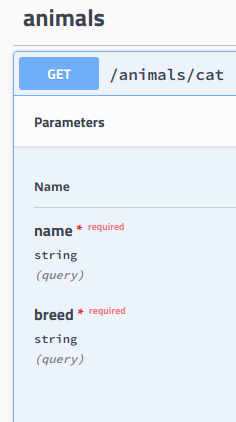 This works pretty well but I have an endpoint where I use @Query params. I created a DTO and annotated the properties correctly with @ApiModelProperty and use it for the corresponding @Query param. The swagger doc is fine but when I generate my JSON schema what I need for validating I don't get the section definitions, where the schema for my DTO gets defined normally. If I use my DTO on a @Body it works pretty fine. Some way how I can "enforce" @nestjs/swagger to always generate a definitions sections of my defined DTOs in the produced JSON. Generate a JSON schema file of my DTOs only. In other words a valid JSON schema file which contains (only) the section definitions because this is what I need for validating my DTOs. The motivation for this, in general, is to only annotate my program with swagger annotations and get then both the documentation and a validation schema for my DTOs out of it. If you have a complete other solution or I do something completely wrong then please let me know. Libraries like class-validator are no solution because then I need two(duplication!) annotations for all of my DTOs. I am aware of the issue that belongs to that problem but I want to work around with one of the two solutions I mentioned above.